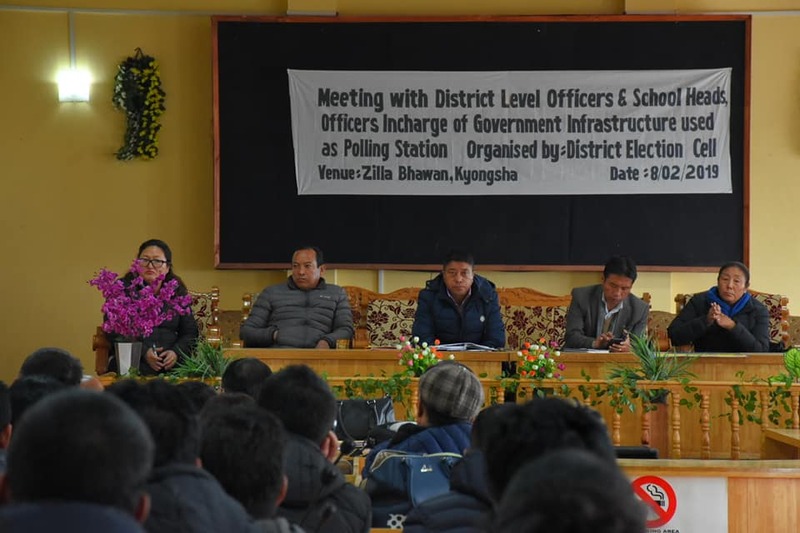 Gyalshing, 08 Feb (IPR): A Meeting with District Level Officer and School Heads, Officers-in-Charge of Government infrastructures used as Polling Station was organized by the District Election Cell at the Conference Hall of Zilla Bhawan in Gyalshing. Present during the meeting were Shri Karma Lodey Lepcha, ADC (West); Smt T. Eden Bhutia, Addl. Dir. (HRDD); Shri. Surat Kr. Gurung, ADC/Dev. ; Shri. Gayas Pega, ADC, Soreng; Shri. Tushar G. Nikhare. SDM, Gyalshing along with HoDs of Schools and Departments. Shri Karma Lodey Lepcha urged all the government functionaries to aid the Election Department for the upcoming general Elections of 2019. He asked all to participate and help them to conduct a free and fair elections in a successful manner. He further informed that a batch wise training for the Polling and Presiding Officers would be conducted soon. Shri Tushar G. Nikhare also spoke to the gathering in relation to various issues of available facilities like ramp for the physically challenged voters which needs to be constructed if the polling stations are close to the road. He also mentioned that vehicles would be made available for physically challenged voter to reach the polling stations in respect to the population. He urged the Power Department to send their respective J.E’s to the respective polling stations for electrifications and proper management. He also informed that from 15-25 Feb, 2019 the Booth Level Officers would be conducting house to house verification of the Electoral Roll. The school heads were asked to facilitate the stay of polling parties and appoint a nodal contact staff for them. He also spoke about that school grounds have been identified as venues for election meetings. The concerned political party need to inform school heads beforehand only. The list of such venues will be given to school heads through Addl. Dir. (HRDD). He also informed that few critical & hyper-sensitive polling stations will be covered under webcasting. The programme was conducted for the heads and in-charges of various schools and governmental infrastructures to be made aware of the election procedures and the necessary actions to be followed prior to the commencement of the Election day.